With GDPR coming into force in May 2018, now is the perfect time to think about the changing regulatory environment more generally and the potential impact on how banks are using data. Effective data use is critical to success in an increasingly competitive industry, with open APIs only likely to accelerate this trend. As such it is vital that banks continue to remain on the cutting edge of changes in this space and prepare themselves for an evolving world. This webinar will discuss how regulation is changing expectations around data use, what challenges this creates for banks, and how they can respond to stay ahead of the competition. Data Transfers under the EU GDPR – do you need to comply? Many organisations transfer personal data across borders to both EU and non-EU recipients. The EU General Data Protection Regulation (“GDPR”) imposes strict rules about how such data should be transferred and applies to many unsuspecting non-EU organisations. Join Tim Hickman, GDPR Expert at White & Case LLP and Richard Hibbert, SureCloud CEO, to get the legal perspective on personal data transfers under the GDPR, and practical guidance on how this issue affects your business. Get ready for the new rules coming in May 2018. Following over four years of discussion and debate, the General Data Protection Regulation has now been adopted by the EU and will come into force in May 2018. This important and wide-ranging piece of regulatory reform will have a significant impact on the operations of any business using personal data, and banking and payments are set to be two of the sectors most affected. Every organization is impacted by the recent increased focus on data privacy rights. Microsoft has long been champion of individuals’ privacy rights and views the General Data Protection Regulation (GDPR) as an important step forward in clarifying and enabling individual data privacy rights. Join Brad Smith, Microsoft President, Julia White, Microsoft Corporate Vice President, and Brendon Lynch, Microsoft Chief Privacy Officer as they discuss data privacy rights and how Microsoft can help advance your organization’s privacy practices to align with privacy regulations such as the GDPR on May 24, 2017 at 6:00 am PT. During this webcast, the Microsoft executives will be joined by three distinguished guests. Webinar Overview: The new GDPR privacy regulations will significantly impact data governance for multinational companies worldwide. In this webinar we will introduce GDPR, talk about the implications to your organization and walk you through a six step process for achieving compliance. 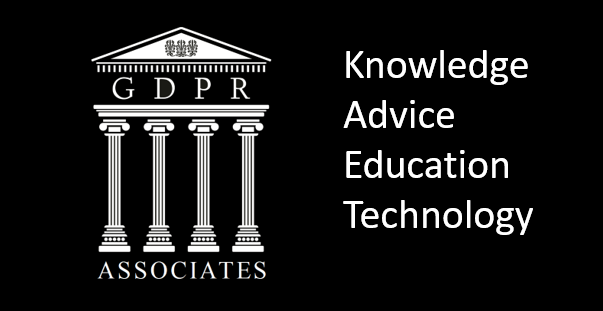 There will also be a brief section to headline the technology based solutions available from Datum and Silwood Technology which will help to make your GDPR journey easier. The European Union’s General Data Protection Regulation (GDPR) will go into effect in May 2018, are you ready. European SMBs’ IT Spending Priorities: Where are SMBs along the Innovation Path? IDC’s most recent European Vertical Markets Survey shows how SMBs are reacting to years of uncertainty. They are more optimistic about business prospects and, if SMBs were silent during the last years, they are now responding with an increasing usage of IT budgets to innovate and upgrade. As adoption of disruptive technologies and 3rd platform solutions become more informed and mature, these organisations slowly embrace Digital Transformation as a mean to reach new innovation levels. GDPR (General Data Protection Regulation) is just over a year away, and many organisations are still trying to understand what this new regulation means to them, their organisation and their data. Join us for the first in a series of webinars which focus on how organisation’s can begin to action GDPR – with this first short session focusing on Understanding Your Data with Informatica Axon. GDPR (General Data Protection Regulation) is only a year away, and many organisations are still trying to understand what this new regulation means to them, and their data governance practices. 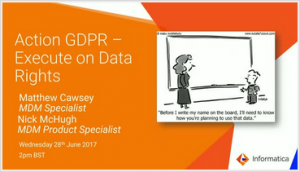 Join us for the second in a series of webinars which focus on how organisation’s can begin to action GDPR – this short session is all about accelerating Data Discovery & Classification, how to automate and put in place a repeatable ‘near real time capability’ with Informatica’s Secure@Source. The General Data Protection Regulation (GDPR) is less than a year away from taking effect with all businesses having to be compliant by May 25, 2018. It will be one of the biggest changes to data privacy law that organizations have seen in decades as it consolidates data privacy regulations across Europe, gives business guidelines on the collection of customer data and gives consumers control over their data. Complying with GDPR is a major task that drives organizational change, requires business process updates and triggers IT technology choices. With only one year left to achieve this overwhelming task, organizations want to know how to best spend their time and which actions to prioritise. On Wednesday 23 May at 2pm (UK) / 3pm (CET), IDC analysts Martin Whitworth and Carla Arend will present a complimentary webcast, providing a snapshot of GDPR readiness of European organizations, which GDPR requirements they see as major challenges and which key actions they are planning to take. Special attention will be paid to the impact of GDPR compliance and cloud usage, as it impacts both customers and providers of cloud services. Duration: 54 minutes. Available On Demand. Data classification is a core component of defining and understanding data that security and risk professionals must protect, as well as identifying the way employees should handle it and the types of security controls that are necessary. Data classification tools, which include manual (user-driven) and automated classification, help organizations apply metadata tags to sensitive data. In the last year, more than half of global security decision makers have implemented data classification. What are their biggest challenges and what are options to overcome them? This exclusive partner-focused session will help you understand how GDPR is affecting businesses, how data virtualization can help your customers to comply with the new regulations, and how you can leverage DV in the field to combat data challenges being posed by GDPR. The European Union’s General Data Protection Regulation (GDPR) will come into effect on May 25th, 2018, and all businesses that serve European Union customers will be required to comply. Companies that fall short of compliance with GDPR will be subject to extremely large fines, lawsuits and the headache of additional audits. Not to mention, the additional cost of rebuilding consumer trust in the company brand. Data virtualization helps enable companies to quickly and easily comply with data protection regulations without investing in new hardware or re-building existing systems. Join us for the third in a series of webinars which focus on how organisation’s can begin to action GDPR – this short session is all about data privacy by de-identifying, de-sensitizing and anonymizing sensitive data with Informatica’s Data Masking tools. In the context of GDPR, Data Masking tackles several critical requirements by protecting and preserving the privacy of customer/employee data. Persistent Masking creates ‘Pseudonymised data’ which replaces the original sensitive data with new values, but critically retaining both contextually and referentially integrity. Alternatively, for production environments Dynamic Masking preserves the original data format, but strictly limits who can see the data. Join us for the final in a series of webinars which focus on how organisations can begin to action GDPR – this short session is all about creating a single place to access, maintain and administer Data Subjects and manage their Consent – with Master Data Management. In the context of GDPR, a mastering process collects Subject Data from across the enterprise and a range of techniques are applied to match & merge data related to the same party, enabling an organization to accurately identify all records related to that data subject from a single place.